ANGERS (Afrobasket/FIBA Basketball World Cup) - Afrobasket debutant Burkina Faso will look to play like regulars at this summer's tournament and win as many games as possible, according to their standout power forward Jean Victor Traore. Last summer, Traore averaged 24 points a game to help his national team book a place at the 2013 Afrobasket which will be held in Ivory Coast in August. The tournament will serve as a qualifier for the 2014 FIBA World Cup. Since they convened for a 10-day training camp in Paris last month, Traore cannot wait to compete against the best African teams. While his athleticism and ability to play near the rim may cause opponents trouble, he prefers to remain humble but still confident. "We are going to respect our opponents, but play hard," the 27-year-old said to FIBA.com. "Our team chemistry worked so well in Paris that it looked like we knew each other for so long. This is a good sign for our Afrobasket debut, I think. "All we need to do is to stay focused and humble when the tournament starts. "Most of us had never met before. But coming together and representing Burkina Faso, the place of our birth, it is an amazing feeling," the 2.04m player explained. 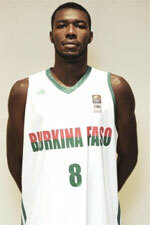 Burkina Faso's qualification for the Afrobasket has unveiled a hidden passion in the country. "At first, people did not know who we were. Now we are greeted in the streets by almost everyone," Traore pointed out. "During the qualifier tournament, we had never seen so many people watching and talking about basketball. Now we are regular reference in the media." With the Afrobasket still some months away, Traore is playing for French Nationale 1 (N1) - the country's third division - for Angers ABC. They had a promising start to the season before a four-game losing streak set them back and their current 7-9 mark has them 11th in the league table. When the Afrobasket tips off in Abidjan, only one member of the Burkinabe team will have had experience in the tournament. Head coach Jean Paul Rabatet, a Frenchman who wants to develop basketball in the country, has coached Morocco and Central African Republic on a number of occasions. He paid tribute to Traore: "He is great offensively. He can defend and think the game. He can play position 3 or 4, and defend big men inside. "I am surprised he is not playing, at least, in the Pro B," he went on. In January 2012, the 62-year-old signed on for two years with the countrys basketball federation. In March he will travel to the USA, with stops in Virginia and Houston, to talk to some Burkinabe players who are playing college basketball there. 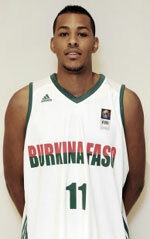 Texas Tech big man and Burkinabe Kader Tapsoba may be on Rabatets radar. The team will need point guards too, the veteran coach believes. "As a team, one of our concerns is at the playmaker position," he admitted. "We have been talking to an American player in Pro B, who may get citizenship and play for us. He will be a great help to us. "We have no more than five players competing at high level. "Our Objective is not much different to other teams as we want to win as many games as possible. "Of course we are not as experienced as Ivory Coach, Senegal or Angola, Rabatet said.